5/23 Cup of Coffee: Portland was rained out for a second consecutive night, but Salem and Greenville picked up impressive wins behind a few late-inning rallies. Trey Ball and William Cuevas turned in great outings and the offense for Greenville was solid up and down the lineup. The PawSox dropped a tough one despite a very solid start from William Cuevas. He went the first six innings and allowed just one run on four hits to lower his ERA to 3.09. He walked two and struck out four. Noe Ramirez was very good out of the bullpen, tossing two scoreless innings without allowing a hit. Kyle Martin took the loss, as he struggled in the ninth and allowed a walk-off single. The offense was quiet on Sunday. Sam Travis doubled in Ryan LaMarre in the third for the only run of the day for Pawtucket. Bryce Brentz went 2 for 4 and Sandy Leon reached twice with a walk and a single. For the second straight day, Portland was rained out. These games will be made up when Altoona visits the Sea Dogs from August 16-18. Salem stole a win with a couple late rallies. Down 2-1 in the seventh, back-to-back walks from Rafael Devers and Franklin Guzman got the inning going. A wild pitch allowed Devers to advance to third, which set up a double-steal to tie the game. In the eighth, an error and a catcher's interference preceded a two-run go-ahead double by Mike Meyers. Guzman stole his seventh and eighth bags of the year and Danny Mars stole two bases to give him 12. Trey Ball turned in another great start, as he allowed just one run and two hits in six innings. He struck out four and walked three. His ERA is down to 1.86. 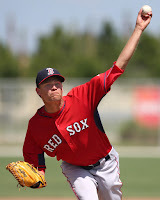 Jamie Callahan picked up the victory after surrendering a run in two innings of relief. Jake Drehoff grabbed his sixth save of the year with a scoreless ninth. After being shutout for the first six innings, Greenville exploded for eight runs in the next three frames to get the win. Joseph Monge and Austin Rei each went 3 for 4 with a double. Rei also scored three times. J.T. Watkins and Trent Kemp also had big days, with two hits and three RBI each. Kemp also walked twice and Josh Ockimey walked three times and scored twice. Jose Almonte was solid, pitching five innings and allowing two runs. He gave up three hits, walked two and struck out four. Anyelo Leclerc picked up his third win in relief after allowing a run in two innings. Bobby Poyner grabbed a two-inning save, his ninth of the year, by not allowing a run. Player of the Night: Trey Ball, coming off seven scoreless innings his last time out, delivered again for Salem. He gave up just two hits and one run in six innings, propelling Salem to a win. He now has a 1.86 ERA and teams are hitting just .165 off Ball this year.